In February 2004, David Bowie made his first Australia and New Zealand tour in 17 years. 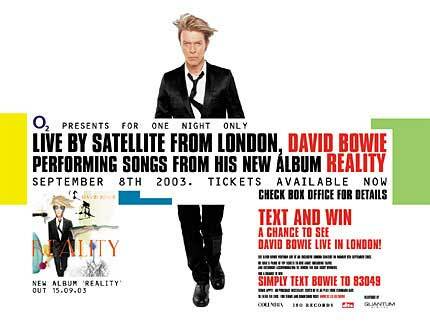 The rumour mill began running hot when on the 8th of September 2003, a Bowie concert was broadcast live from London into 68 cinemas worldwide - including 3 in Melbourne and 3 in Sydney. In a satellite interview with Richard Wilkins, Bowie confirmed that Australia was on the tour agenda. By the time tickets went on sale for the Australian dates, Bowie's A REALITY tour was half way through the first European dates with the USA and Canada to follow. The powerhouse band consisting of Earl Slick and Gerry Leonard (guitars), Gail Ann Dorsey (backing vocals and bass), Mike Garson (keyboards), Sterling Campbell (drums) and Catherine Russel (backing keyboards, backing vocals) promised a tour that was extremely music focused. The band had rehearsed approximately 50 songs and this would allow Bowie to customise each show and make it unique from the last. On November 5, fans had the first opportunity to purchase tickets from the official website, www.davidbowie.com. Four dates were initially announced in Brisbane, Sydney, Melbourne and Adelaide. In addition to this, the ticket agencies (Ticketmaster, Ticketek and Bass) had their own internet pre-sales starting approximately one week later. Prices ranged from $99 for Gold seating and up to $175 for Diamond.When tickets opened to the wider public on November 13, they sold fast. A second Sydney show was added two hours later (the first reportedly sold out in under an hour). In the following weeks, a second Melbourne date was added as well as dates in Wellington and in Perth. NEXT PAGE: Lead up to the first Concert!